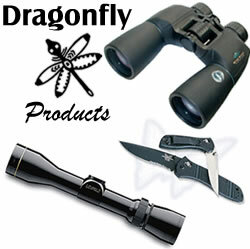 Dragonfly consistently delivers reliable high performance optics and hunting supplies. Our philosophy is simple. From our most advanced optics to our smallest pocket knives, we will provide, you our customers, with the best of the world's outdoor equipment. We provide the facts, data, information and history to help you select the best products for your success in the outdoors. Dragonfly Products is an Authorized Leupold Golden Ring Dealer. Each Dealer must meet a strict standard of qualification to become a sales partner for Leupold products. Authorized Golden Ring Dealers are qualified to help you select equipment that is right for you. Authorized Golden Ring Dealers are inspected, certified, and regularly visited by Leupold field representatives to ensure they are trained and equipped to meet customer needs. Additionally, every Leupold product purchased through an Authorized Golden Ring Dealer is backed by a specific product warranty. Dragonfly also carries a full line of Swords. We have Japanese Samurai weapons, Medieval replica swords, Scottish Broad Swords, Tai Chi Swords and Fencing Swords. All our weapons are battle worthy and historically accurate. We are adding swords, knives, daggers and other medieval, fantasy and oriental weaponry. We sell only the best, including Paul Chen. Contact us about anything you cannot find on our site. We will find it and give you the best price! Also check out our excellent selection of hunting supplies and optics. Our Binoculars, Knives, Rangefinders and Scopes are the best products available. And remember, if you don't see what you are looking for email us at customerservice@dragonflyproducts.com. Copyright© 2002 www.dragonflyproducts.com. All rights reserved.